Fruit - globose, red, 8 mm. in diameter. DISTRIBUTION. Southeastern and Southern Brazil (S Minas Gerais, S Espirito Santo?, Rio de Janeiro, Sao Paulo, Parana, Santa Catarina, Rio Grande do Sul): Atlantic and seasonal forest, to c. 1800 m altitude. 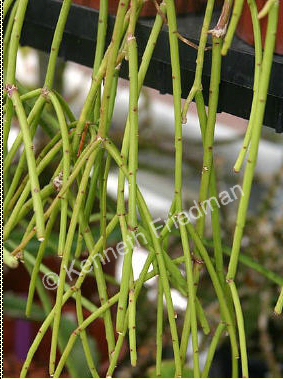 This subspecies is characterized by reddish tinged stems (when in strong light),flowers c. 18 mm diam. 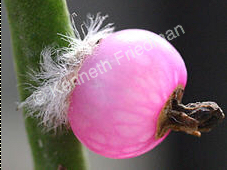 or larger, and usually deep pink (more rarely whitish) fruits. The synonymous R. gibberula F.A.C. Weber, a white-fruited variant, seems to belong here, rather than in subsp. floccosa (as indicated by specimens labelled R. gibberula received at Kew and New York from Paris in 1902, K!, NY!). It may represent a shade form. 4. RHIPSALIS PULVINIGERA A. G. LINDB. in Martius, Fl. Bras. 4(2): 272. 1890.
ramulis crassiusculis subcylindricis vel rotundato-angulatis apice obtusis ad 3-5 fasciculatis articulatis; squamis regulariter spiralibus semiorbicularibus brevissime acuminatis margine planis fimbriolatis pro rata majusculis diutius persistentibus, ramulis sub squamis pulvillum referentibus, axilla villo parco et setis minutissimis manita; floribus solitariis pro rata majuscules e cavitate axillae erumpentibus membranula minutissima rupta suffultis; ovario breviter cylindrico probabiliter uniloculari placentis 4, immerso pube parca cincto glabro ; perigonii phyllis inaequalibus c. 12 exterioribus brevibus triangularibus obtusis, mediis oblongis obtusis, intimis oblongo lanceolatis acutis; staminibus dimidio phyllis perigonii brevioribus antheris parvis; stilo stamina manifeste superante ad c. 1/5 in stigmata 4 recurvata diviso. CAULIS primum erectus dein curvatus et pendulus c. 50-60 cm. longus; ARTICULI et rami obscure virides laeves nitiduli 3-4 mm. dia metro verticillatim fasciculati rarius solitarii divaricati. AREOLAE regulariter dispositae manifesto impressae. SQUAMAE 1 mm. latae, 0.7-0.8 mm. longae, potius fimbriolatae quam dentatae rubescentes intus roseae. FLORES sessiles 2.2 cm. diametro explanati, PHYLLA INFIMA vix 3 mm. longa flava, summa ultra 1 cm. longa, 4-6 mm. lata, alba subflavescentia. STAMINA recta 0.8-1 cm. longa. BACCA purpurea.